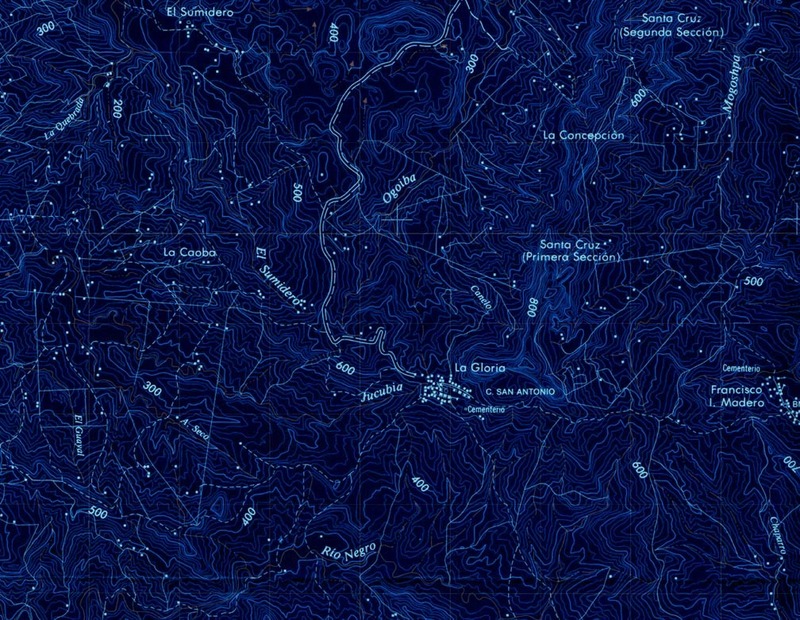 Objectives: For 17 years, since its discovery in 1977, the flooded tunnel marking the deepest point in Sistema Huautla, Oaxaca, México - a remote place known as the San Agustín Sump - remained unexplored. Cave diving efforts using traditional Scuba in 1979 and 1981 failed to pass the underwater tunnel due to the logistics of transporting sufficient cave diving equipment down 92 vertical pitches and tension traverses. The sump lies at a depth of 1325 meters and requires the use of multiple, staged underground camps in order to reach it. 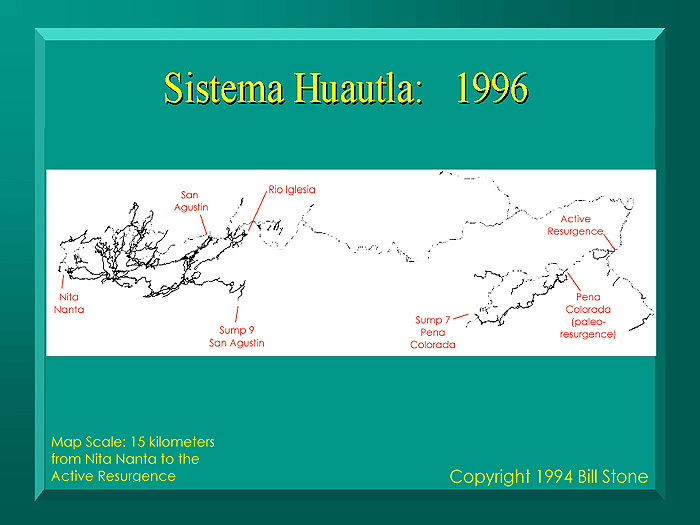 The focus of the 1994 expedition was to use modern closed cycle life support systems (rebreathers) to allow for protracted underwater exploration at the San Agustín Sump and, hopefully, to reach air filled galleries beyond the sump that led into the heart of the Huautla Plateau. Accomplishments: Following two months of rebreather training in northern Florida in both 1992 and 1993, the international team began assembling on January 15th, 1994 in Gaithersburg, Maryland, USA. The following five weeks were occupied with rebreather assembly and checkout (nine Cis-Lunar MK4-B units) and with dive testing this equipment at Ginny Springs in Florida). By March 1, basecamp was established in the village of San Agustín Zaragoza, México and political negotiations were completed successfully at the federal, state, county, and village level. On March 16th Camp 3 was reached and by March 23rd, 1994 Camp 5 was established, suspended 3 meters above the San Agustín Sump (Sump 1). Sump 1 was explored during the following week by Noel Sloan, Steve Porter and Ian Rolland. They reached a penetration distance of 250 meters on a southern bearing but were greatly hampered in their efforts by poor visibility and a complex breakdown maze at the 200 meter point. Several days later Ian Rolland and Kenny Broad returned to Camp 5 and, during the course of three highly successful solo explorations, these two cracked Sump 1, at a distance of 430 meters from dive base, and entered a large airbell (12x50 meters) with a sand beach. An underwater tunnel (Sump 2) led off the southern end of the airbell. Rolland set off solo to explore this underwater tunnel but failed to return. It is believed that Ian (who had recently been diagnosed diabetic) blacked out from hypoglycemia (low blood sugar) while diving Sump 2 and subsequently drowned; data downloads from the onboard "black box" indicated that the diving apparatus had been functioning properly. The 6-day recovery effort and accident analysis are presented in detail in the final reference below. On April 8th the expedition resumed when Bill Stone successfully explored Sump 2 and emerged 170 meters later in a large air-filled continuation of the river passage. He explored this for some 300 meters before turning around. 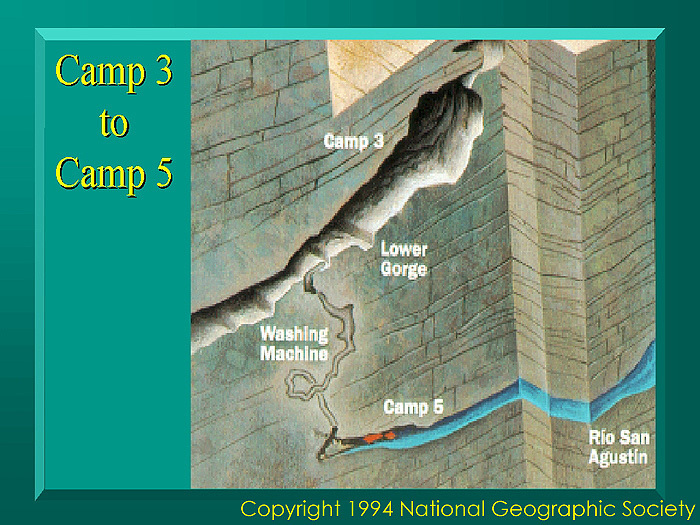 Three weeks later, on May 1, Barbara am Ende and Bill Stone, supported by Noel Sloan, Steve Porter, and Jim Brown, dived through Sumps 1 and 2 and established Camp 6 some 500 meters beyond the downstream end of Sump 2. From there they spent the next six days exploring and mapping 3.3 kilometers of previously uncharted territory before being halted at Sump 9. The depth at that point is 1475 meters. 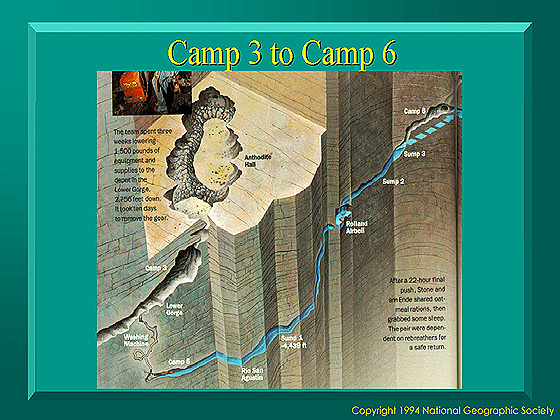 The final chamber leading into Sump 9 is immense -- nearly 100 meters across -- and the sump itself is 50 meters wide. The final push, including the six days spent beyond the sump, comprised 18 days underground. 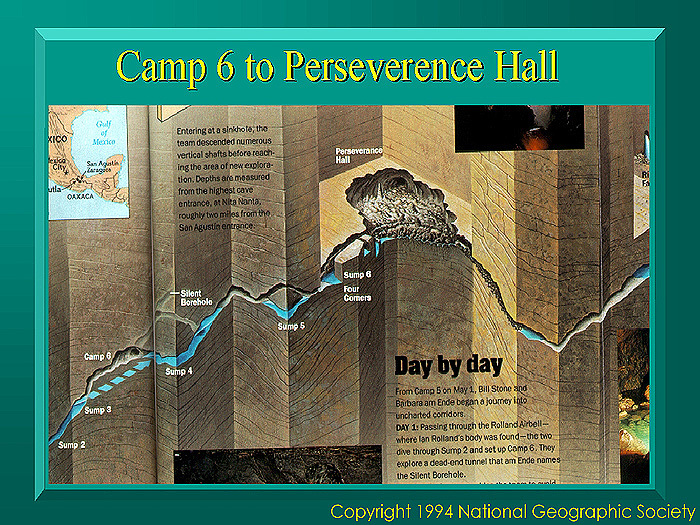 The subsequent derigging trip, which utilized 6 of those 18 days, was assisted by Bev Shade and Don Broussard. The expedition returned to the United States at the end of May, 1994. Subsequent data analysis showed that Sump 9 was more than a mile beneath the Mazatec village of Santa Maria Asuncion, on the southern flank of the plateau. The gap to the Peña Colorada cave was closed to 4 kilometers. 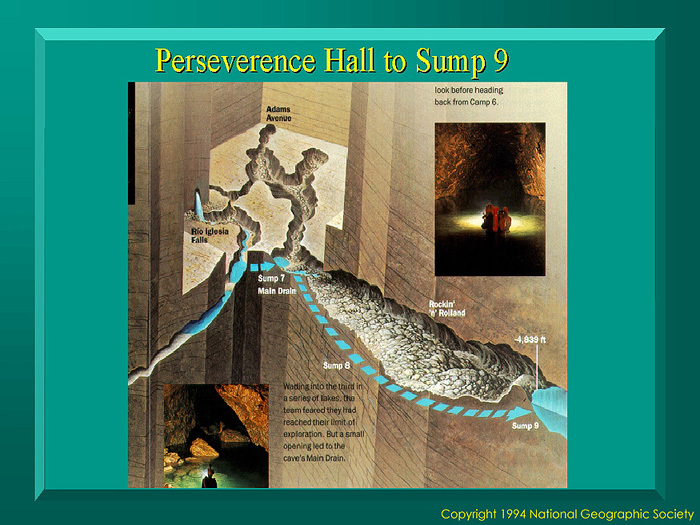 Also of significant importance was the discovery, on April 12th - 14th by Bill Farr, Tom Morris, Paul Smith, Noel Sloan, and Steve Porter, of a going upstream tunnel at the active resurgence for Sistema Huautla, located at the bottom of the 1600 meter deep Santo Domingo canyon, 10 kilometers south of San Agustín Zaragoza. Porter logged the final push, on a MK4 rebreather, to 230 meters penetration. Average depth was 12 to 20 meters and the tunnel continued with 5x5 meter cross section beyond Porter'slimit of exploration. Dye traces conducted in 1988 by Jim Smith had proven this location to be the only known exit for the water that enters Sistema Huautla, but prior to 1994, the spring tunnel was thought to be impassable. The only earlier diving in this spring was by Noel Sloan in 1984 (during the Peña Colorada expedition). The visibility then was extremely bad and the unobvious route onward, easily seen in clear water in 1994, was missed. Stone, W. C., am Ende, B., and Paulsen, M., Beyond the Deep, 2002, Warner Books, Inc., 1271 Avenue of the Americas, New York, NY 10020. Signed copies are available here.